Prague based talent Tom Peterka aka Tom SMall is one of the upcoming producers from the Czech Republic. His involvement in the electronic music scene started from just 16 years of age. His background is one that comes from listening to a wide variety of music types with his friends, and then trying to mix it all together. After a few months, he decided to make his own sounds, and after five years working on his production skills he made his debut on Czech label Deafmuted Records with a track called ‘Paralyzing ways‘ which was a part of the compilation ‘Depthblinded part 3‘. This signing really spurred Tom on and inspired him to make ‘Fiction / Remover‘ as a solo single on the same label. This release really showcased Tom’s progresive experimental sounds, all composed in a deliberately ‘steppy‘ form. His next releases were all big ones. The ‘Skepticism EP‘ skiped into the electronic music charts with its sophisticated and extraordinary tracks. After that, further releases followed on Dispatch Recordings (a collaboration with Bredren on the Transit 2 LP), Zenith Music and of course Broken Audio, which have set him out as an artist to watch for. 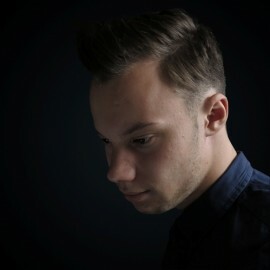 With future releases on Broken Audio, Dust Audio and Im:Ltd, 2014 already looks exciting for this promising young musical talent. As a DJ, his sets are focused around deep sounds that evolve into heavy stepping deep / neurofunk vibes building and creating a story of music in each of his sets. With bookings already in Slovakia, Belgium and Czech Republic his popularity is rising fast with a fast growning reputation as the most evolving talents of the Czech electronic music circuit. 2. Name a track by another producer you wish you had made? 3. Your perfect day off would be doing? Drinking some really good drinks on a beach in Thailand or Croatia. 4. If you could remix one track, what would it be?